We all know by now that I am a huge fan of historical fiction, and if it's Australian history then I am a happy reader indeed. I'd never heard of Kim Kelly before, but she's written a few historical novels before this one, called Black Diamonds and This Red Earth. As she says in the author's notes, her work uses history as a set piece, and occasionally her novels do feature real people from history, but they are works of fiction primarily and need to be viewed as such. This novel takes place in a fairly under-represented time period in fiction, at least of late, the Depression years. It is set in Sydney, and the major event of the time is the construction of the Sydney Harbour Bridge. The bridge works also stand in as a metaphor for the instability of Sydney at the time, with the trade labour shortage and the political tensions between State and Federal Labor governments. It is told in the voices of Eoghan (Yo-un) O'Keenan and Olivia Greene, who come from quite different backgrounds. They are connected by the blue mile that is the bridge. Eoghan is a poor Irish immigrant who runs away from an abusive home after losing his job at the local bootmaker's. He takes his younger sister Agnes with him, and they spend a few nights on the swag, sleeping in the Botanical Gardens while Eoghan searches for a job and somewhere to live. Agnes invents a fairyland in the gardens to look over them, and so when she spots Olivia for the first time, she thinks this is a fairy princess come to life. Eoghan and Olivia are immediately drawn to one another, but it is Agnes who seals the deal, enchanting Olivia when she agrees to watch her for the day while Eoghan goes to work. Olivia is a dressmaker and a designer in Sydney's Strand Arcade, who idolises Coco Chanel and eschews the things a girl her age should be thinking about, namely marriage and reputation. Her mother is in the business of gold-digging, but Olivia is forced to admit that she may actually be in love with her new husband, a barrister named Bart, who takes Emily to London with him. Olivia convinces her mother to let her stay behind. She becomes costumier to Lady Game, the governor's wife, and her fortunes wax and wane with theirs as the controversial premier, Jack Lang, begins to make trouble. This book is fast paced and authentic, without having too much detail in it. There is a curious balance in the plot between the romance of Eoghan and Olivia and the growing trouble between the government and the trade unions. Each narrator had a compelling voice which kept me turning the pages, although at times entire chapters were made out of exposition. Only the character of Agnes kept this novel from falling into cheesy romance territory at times; and even she couldn't change my amusement as Olivia begged Eoghan to "ruin her" (she meant reputation but it was just too much.) What I most liked was the way a period of history that I had never done much thinking about was brought to life; I had never realised that the building of the Sydney Harbour Bridge was so dangerous or precarious, and it's symbolism and significance towards National identity are now much more clear to me. I particularly loved the character of Ollie because she was strong, despite being bullied in the past, and stuck to her dreams. I could easily see why Eoghan loved her. I gave this book three stars. 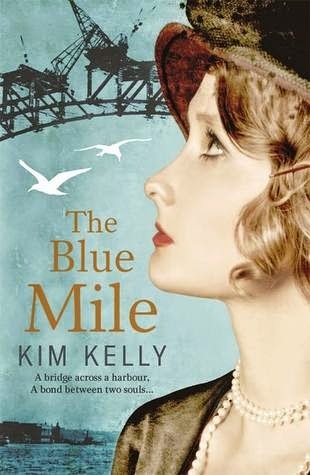 Want to win a copy of The Blue Mile PLUS a bonus surprise novel? I have been enjoying Australian fiction more and more lately. I'll definitely be adding this one to my reading list!